Search the top Oregon RN to BSN Programs. Our comprehensive guide includes detailed information on becoming a Registered Nurse and degree requirements and details on Oregon RN to BSN Programs. Searching for a career that can potentially provide through thick and thin can be a tedious task. For those that are already in a career, finding a way to increase career potential can be just as tedious. Oregon has many healthcare facilities throughout the state (both public and private) and sometimes an RN to BSN can be helpful in attaining or advancing a career with one. The medical field is a career field that is constantly changing. New sciences, techniques, and technologies contribute to a changing environment that requires professionals to stay up to date in order to remain competitive in the field. In the nursing field, specifically, workers must be able to prove that they are better qualified and more knowledgeable than other candidates when applying for new positions or promotional opportunities. A good method for trying to provide better working opportunities in the nursing field is taking part in one of Oregon’s RN to BSN programs. These programs are available throughout the state and provide current nursing professionals with the opportunity to earn bachelor’s level degrees. Not only do these programs provide a plethora of new information in science and communication, but they can also contribute to a better financial career and more career opportunities. The information gained throughout these programs provides the most up to date techniques, which can ensure that those nurses have the opportunity to possibly show a higher level of qualification. Over the years, Oregon’s population has grown to nearly 4 million. The northern location of this state provides for a unique atmosphere with some of the most inviting residents throughout the country. Oregon is a great place to live. The state provides great educational institutions throughout, valuing the quality of their education. For nurses that are seeking higher degrees, there is rarely a better place to find a great start. It can sometimes be difficult to allocate time for classes and studying which is why you see many RN to BSN programs designed with a current career professional in mind from their education syllabus to class time options. The RN to BSN programs throughout the state are designed considering the busy nature of registered nurses. Classes are available both in-class and online, giving users the opportunity to choose the most convenient route. With the need for registered nurses constantly high, taking part in these nursing programs is a career choice that could continue to pay off over time. The benefits for advancement are grand with a higher degree as some employers may make that higher level of degree a requirement to even be considered for some positions. Nurses that are working in the field at a bachelor’s degree level will find that they can earn $82,840 per year on average in Oregon (source). The state of Oregon is on the higher end of pay for nursing when compared to the national average, making it an even more desired place to get a start by many. 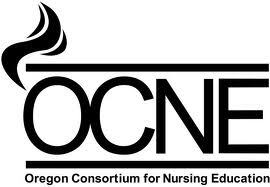 OCNE, or Oregon Consortium for Nursing Education, is a collection of eight community college Nursing programs in Oregon (listed below) that have partnered with OHSU to provide ADN graduate nurses with an easy RN to BSN bridge program. Additionally, OCNE is a shared education curriculum and philosophy. The eight community colleges in partnership with OHSU have agreed upon an education platform that remains uniform from Nursing program to Nursing program and that adequately prepares students to transition from Associate Degree trained RN to Bachelor of Science degree Nurse. Students enrolled in one of the eight community colleges partnered with OCNE have two options for completing their Bachelor of Science in Nursing from OHSU. The first option is for students currently enrolled in one of the community college Nursing programs to leave the program during the sixth and final term and transfer to the OHSU Portland campus. While completing their BSN at OHSU, students will attend class on-campus and online via a hybrid course. This means that the student does not graduate from the community college nor do they receive a degree or diploma from the college. Instead, after completing the remainder of their education at OHSU they would receive their Bachelor of Science in Nursing from OHSU. This also means that the student would not be eligible to sit for the NCLEX-RN exam until after graduating from OHSU approximately one year later. The second option for OCNE students is to graduate from their community college and then continue on to OSHU to receive their BSN online. One obvious advantge of this option is the student is eligible to sit for the NCLEX exam prior to finishing their BSN. This allows students to receive their RN license, begin working as a Registered Nurse, and then purse their BSN at a later date. However, students that graduate from community college first do not have the option of attending OHSU on-campus. Instead, students enroll in OHSU and begin their BSN education with an online cohort. Depending on if the student is pursuing a part-time or full-time tract, the cohort then progresses through the BSN portion of their education together with an anticipated graduation within 12 to 18 months. How can I take advantage of OCNE? The only way to participate in the OCNE program is to enroll in and be accepted into a participating community college Nursing program. The eight programs are Blue Mountain Community College, Clackamas Community College, Lane Community College, Mt. Hood Community College, Portland Community College, Rogue Community College, Southwest Oregon Community College. In the Fall of 2014, two additional schools will become OCNE accredited and approved: Treasure Valley Community College and Umpqua Community College. If you are not enrolled in one of the above listed community colleges, then, unfortunately, you will not be able to participate in the OCNE program. However, there are many online BSN programs available to you as an Associate Degree nurse. If you are enrolled in one of the above listed Nursing programs, then you can take full advantage of the OCNE program. But you do not have to. There is no requirement or obligation from the student to receive their BSN from OHSU. All other BSN or MSN options are available. OCNE only happens to be one convenient way for Oregon RN students to easily transition into a BSN program. If you are still curious about OCNE, check out their website and contact one of the advisers listed.